After that you just install it, and sign in with your account (which you created very easily when signing up for the beta if you didn’t already have one) and you’re on your way with tweetdeck! So what is it for those that never used it? Quite simply it’s a catch-all for your twitter accounts if you happen to have more than one (one personal, and one for a tech blog perhaps?) as well as put in a facebook, foursquare and buzz account in the app. This gives you one centralized location for all your content. Honestly, and ironically, this seems to be sort of what Motorola was going for with their “unified inbox” on the Droid X and Droid 2, but in reality, they do it much better than Motorola did, and unlike Motorola, they know not to try to include your work email and contacts with your twitter and facebook accounts. So once you sign in to all your accounts, you then get a feed that shows all the updates you would see while logging into each individual account, all in one straight feed. They’re color coded so you know if they came from facebook, twitter, etc, as well as you can swipe left and right to view only content you posted or comments to your direct posts, as well as a page for direct messages. 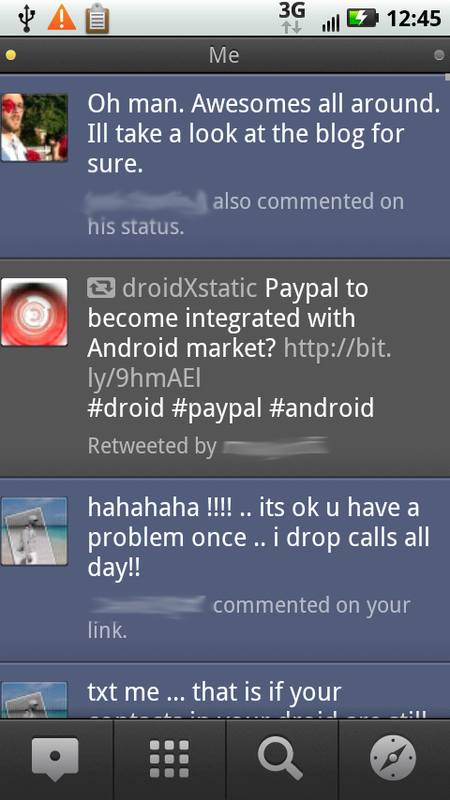 I should point out this is primarily a twitter client, that just happens to support facebook and foursquare, etc. So you won’t be able to create photo albums on facebook or things like that you would find in the full featured facebook up. Now the real shining gem, and the whole point to this application and service, is one update for all networks. When you post an update through this program, it puts buttons at the top of the screen to select which accounts you want this message to get posted to. So if I wanted to announce the latest update for an app, I can simply type it once and broadcast it to facebook and twitter at the same time. As well if I wanted to post something across multiple twitter accounts, this will accomplish that too. You can pretty much mix and match any accounts you’ve linked to tweetdeck while posting an update. Another nice feature that Foursquare can’t even do, is it will pull up a map and let you see things located on the map available for check-ins near you. As well as color coded dots showing where your friends checked in. It’s really a nice feature you would’ve expected to see in the official foursquare app, and this is one area where tweetdeck very well may be a replacement for the full-blown foursquare app as you can do everything and more in tweetdeck, that you can do in foursquare. 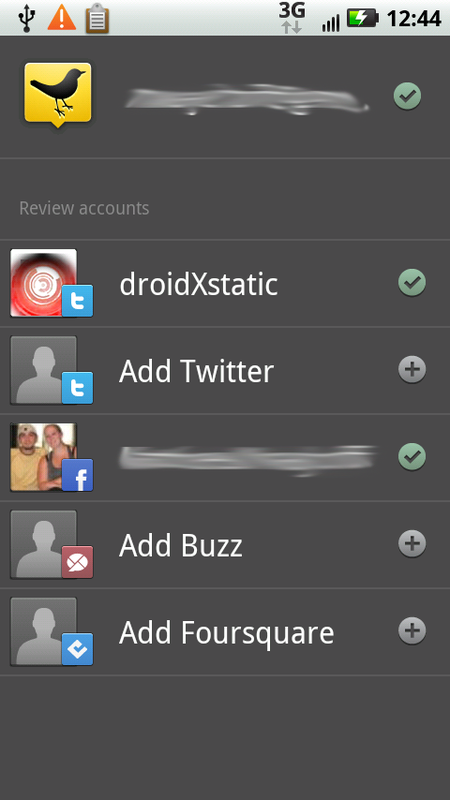 If you’re a heavy user of Twitter, Facebook, Foursquare or Buzz, then this app is for you! Remember, sign up and download here!